High Rigger Mountain: A Festival of Bush Bashing! Every weekend brings a new adventure: in the past month, I’ve been up Cederstedt and Kokummi Mountains, and in a kayak for two multiday trips! The warm sun and longer days are telling me that summer is right around the corner, and after a fantastic winter, I’m looking forward to the adventures, both short and long, that we have scheduled for this summer. In particular, I’m looking forward to my Cervus-Wolf Divide trip – seven days in the mountains of Strathcona Provincial Park. This report is going to focus on the festival of bush-bashing known as High Rigger Mountain. Our route with all the photographs placed on it. view the topographical map, annotated with photographs. Download available. Phil emerging onto one of the alder filled roads. Phil on the steep snow, leading to the long ridge below High Rigger Mountain. Our adventure started on an old logging road, Stowe Creek Mainline. We were looking for a phantom road: one that appears on the GPS and Backroads map book, but is invisible. There is no evidence of the road remaining on the mainline. We backtracked and exited the vehicle. Some simple searching revealed the overgrown road grade, and the five of us were hiking by 8:30 am. Up and over the small embankment, we followed the remnants of the road to our first obstacle of the day, a water crossing. We didn’t know it, but this was foreshadowing of things to come. The shallow crossing required dexterity and nerves of steel; there wasn’t any particular threat of death, but the water was knee-deep and I didn’t want to do the hike in wet boots. We all rock-hopped, one stone to the next, as we crossed the creek. I was more nervous than the others and took extra care, because I carry my large camera in a chest case. A fall in the water would mean the loss of the camera – and the end of this blog! Three of us made it across without incident, while two of the group landed in the water and were forced to hike with one wet foot. Nevertheless, spirits were still high; the pull of the high alpine views was a siren’s call we couldn’t resist. Our description read “follow the old logging road”. It’s old, alright, and completely overgrown by slide alder. We swerved in and around, over and under the trees. The going was slow, but we were heartened by finding a ribbon on the left, marking an apparent entrance to the treed slope. We took a chance and passed through it, walking east. The terrain was very forgiving, at first; however, it became steeper as we climbed. At some points, we used our hands on the trees to steady ourselves. Eventually, we intersected the tail-end of another section of old logging road, E Road (~820m). Emerging from the dense forest, we all stopped in our tracks. There was a short treeless gap between us and another dense maze of alder; beyond that, an even thicker wall of alpine fir and hemlock. The road below was dense with alder, but in comparison, what stood before us was a wall of wood. The trees were two to four inches in diameter and eight inches apart. To make matters worse, the weight of the winter snow had pushed them down, and many of them grew at a 45-degree angle to the road! It was a maze to work through. We took another chance, crossing the short section of road and heading up into the thicket of planted trees. As luck would have it, we found a ribbon exactly where we intended to enter. It was encouraging to know that some other sucker had travelled this route too! The five of us zig-zagged up through the bush, with our hands in front of our faces, using our bodies to push the boughs of the trees aside as we followed our route to what we hoped would be the toe of the ridge. It was difficult to keep track of each other through the density of the forest; if we were eight feet apart, the boughs obscured our view of each other, and sounds were muffled if we were more than 25 feet apart. The lack of sightlines, and constant careful navigation through the muggy forest, made for tough hiking. Temperatures were rising, and what sunscreen hadn’t been stripped from my body by the trees was combining with sweat and rolling into my eyes — so much for waterproof sunscreen. It was difficult to find a way to wipe it clear, as my shirt was also drenched. After what seemed an eternity, we emerged from the bush at a bluffy headwall (~900m) that reached more than 20 metres above us. We followed the wall right (south), where Phil found a ramp that led to another and another, eventually leading up over third-class rock to the lower regions of the ridge above. It was relatively easy, but I worried about Stefanie; the terrain was much more challenging than we had rated the trip. Yet somehow, she was still in high spirits, and performed like a champ! 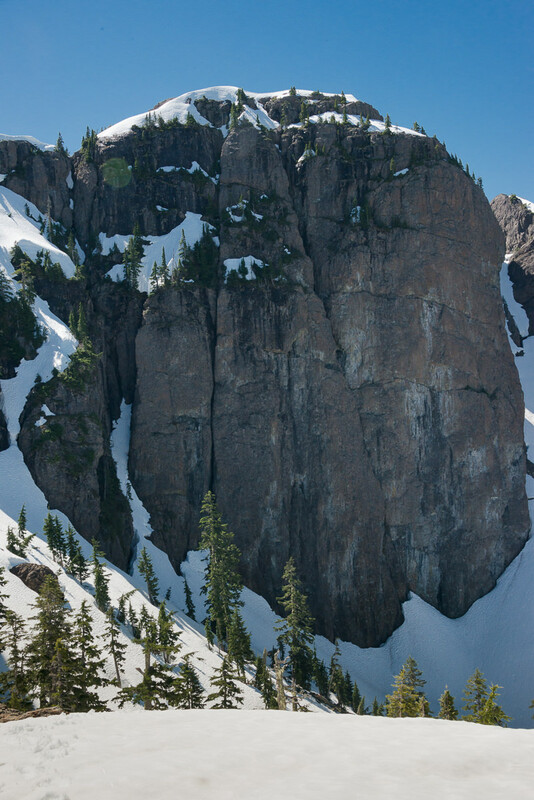 At last, we stepped out of the trees onto a rocky snow-covered ledge (~1100m) to admire a view of the Stowe Creek valley below, and H’Kusam Mountain beyond. We had a long route ahead, and we still could not see the summit. 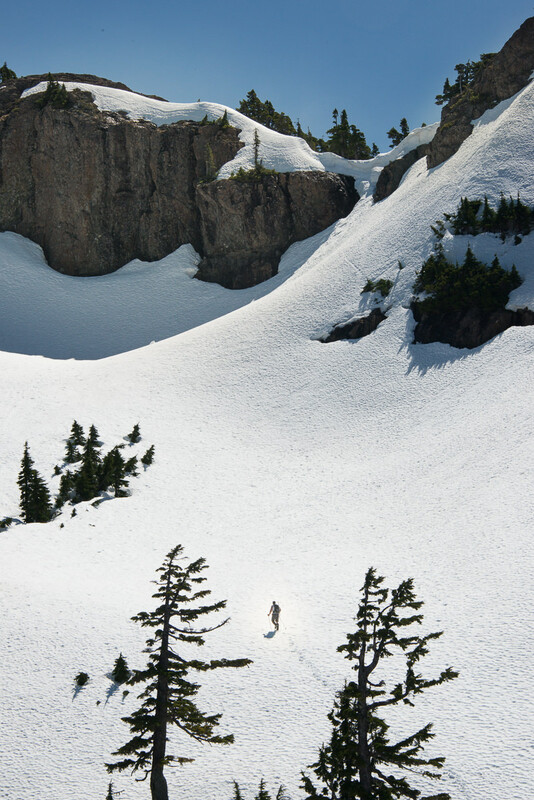 Once on the snowy terrain, the trees opened up to old growth and we were able to freely walk. We passed over a few bumps by kicking steps to ascend our way to the cirque (~1200m) below the high ridge above. The cirque was easy walking into the bowl, though there were steep slopes up to the ridge above, and some were topped with cornices that would create a big challenge. 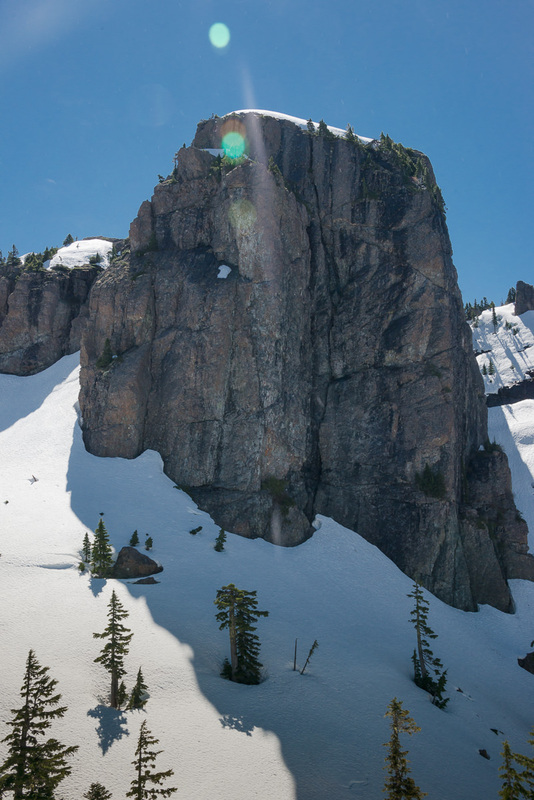 On the ridge above, we could see two large rock promontories emerging from the ridge, each with long cliff faces and broad cracks (maybe suitable for climbing). We avoided the cornices by following a steep snow ramp that would allow us to gain the ridge above (~1340 m). 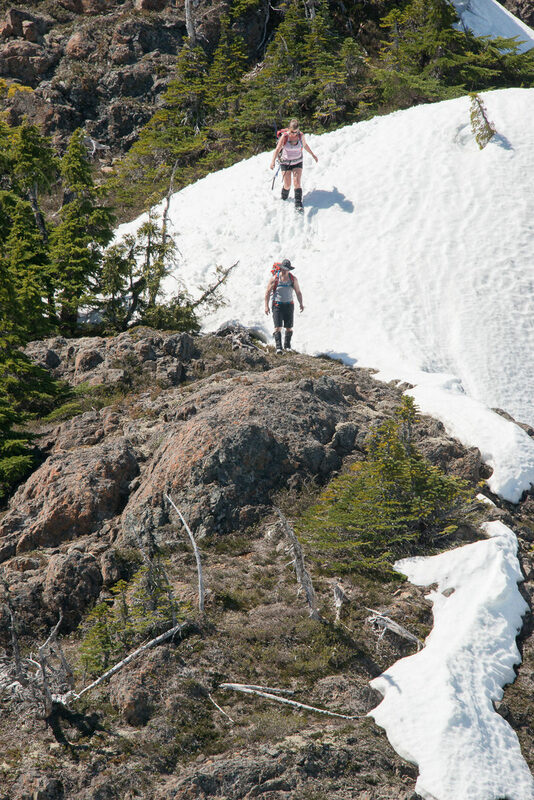 The cool snow was much more enjoyable to walk in than the muggy forest, and the fatigue we’d felt in the forest was blown away by the cool breeze that brushed past us as we created our ladder of steps to the ridge above. It was a lot of fun kicking steps up the steep slope, driving the ice axe deep into the snow as I climbed. Many times, I looked off behind me at the surrounding landscape, and with each step I could see farther. The others were enjoying it too. At the ridge, we got mountain dumb. With the rocky promontories so close, we set off following the ridge to the higher of the two bumps. Navigating over smaller bumps and around trees was easy. I was still working my way along the ridge as I watched Phil reach the summit and triumphantly throw his hands up, turning back to smile at me. Then, suddenly, a scowl overtook his face. He picked up his GPS, muttered something, and came lumbering back down toward me. “Don’t bother,” he grumbled as he passed me, “We went the wrong direction. It’s over there.” He pointed behind me, and I turned to see where we’d gone wrong. We had been so fixed on these tall bumps as we ascended the ridge, that we didn’t even bother to look farther to the east. We’d completely missed the summit! It was a major letdown. 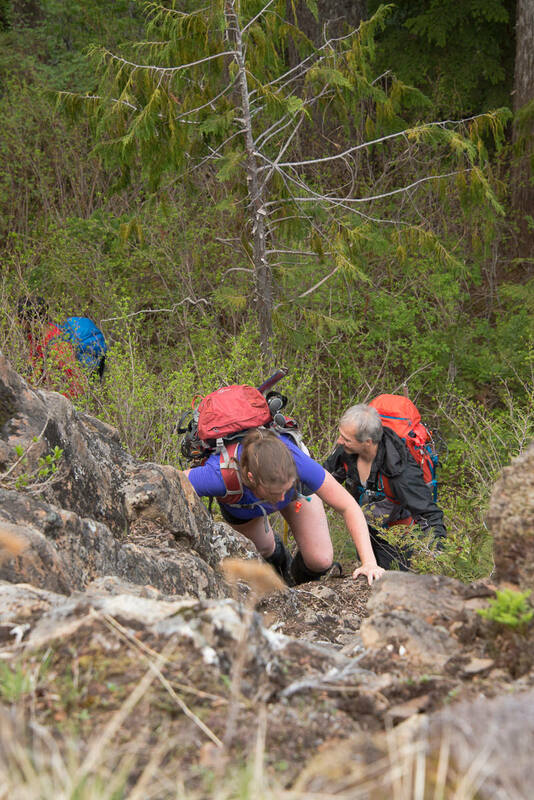 Stefanie looked at it in defeat and figured that it was too far her to reach; the effort of the day, along with the thirty kilometres she had hiked the day before, was taking its toll on her. At the ridge, we got mountain dumb. Although the peak looked far away, the false perspective of the mountains wasn’t enough to fool me. I explained to Stefanie that the stunted trees were fooling her eyes. We backtracked and followed the snowy ridge toward our new objective. It was quick: within 30 minutes of our false-summit, we stood on the summit proper of High Rigger Mountain (~1464m). As we stood and examined the surrounding landscape, we looked for a better return route that would be easier to descend. Though our maps made it look like the ridge could easily be followed to a lower section that would run across to Milner Mountain, several sections of bluffy drop-offs blocked the way. It may yet go, but I expect that a rappel may be needed. We posed for photographs, ate our lunch, and enjoyed the heat of the day. I kicked my boots off and sat staring off into the strait below: the view was spectacular. We didn’t stay too long, as our “short hike” had already gone longer than I’d expected the whole day to be. Our descent to the lower ridge was very fast. The snow was perfect for plunge stepping, and we lost several hundred meters of elevation in less than 30 minutes. 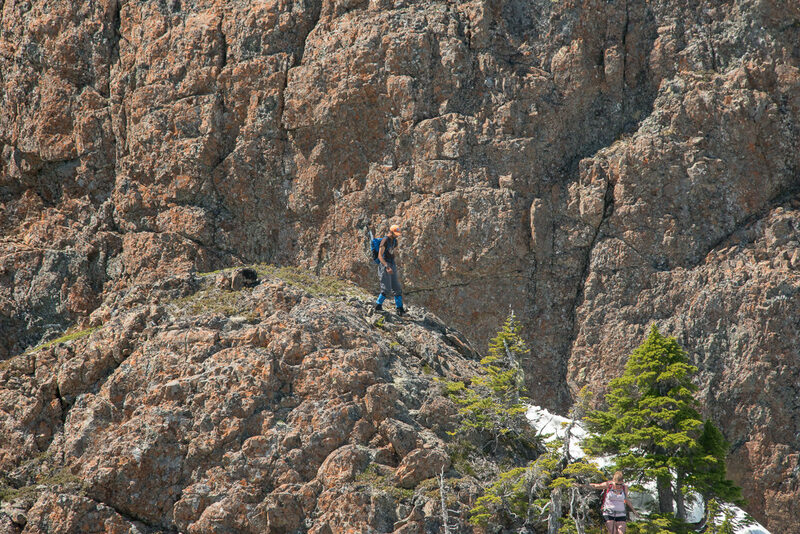 From the lower ridge we chose a different route, one that would avoid the exposed rock down-scrambles. The downside? Though we were only 200 metres away from our ascent route, the bush was thicker! I’m guessing at least B4, if not B5 bush. It made the ascent look like a walk in a pleasant Victorian garden. 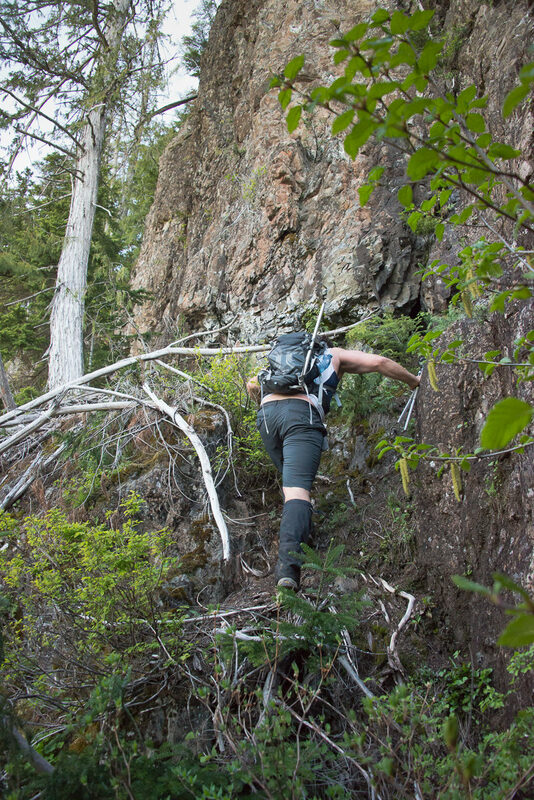 Our descent route was steep, but the dense bush made for easy handholds and in some situations probably made it impossible to fall. At one point, I stopped and waited for Rishi. As he pushed through the thicket, I could see my own fatigue and emotion reflected in his face. Our bodies were still filled with energy, but we were mentally exhausted from the effort needed to navigate through the bush. Finally, we arrived back at the river, which was flowing more, fed by the melting snow of the hot day. Stefanie was so exhausted that she didn’t trust herself to hop the rocks. Instead she opted to wade through the now thigh-deep water, boots on, to the other side. We arrived back at the car several minutes later, relieved to be out of the bush and back at the car. 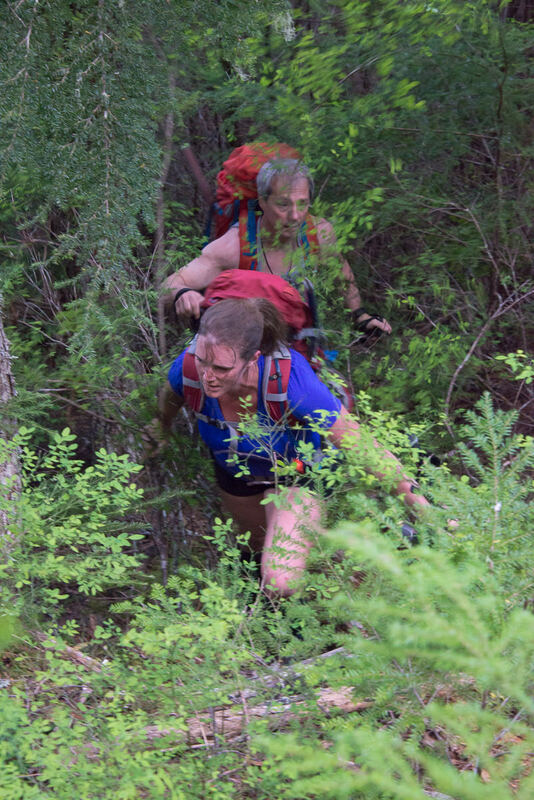 Once changed and hydrated, we were in better spirits, and we reflected on the bush bash we had just survived. I arrived home much later than expected. Kim greeted me with a frown: Christmas was definitely ruined. Another “Worst Husband of the Year” award pinned up on the wall. I did make it in time to put Hemingway to bed, and clean up the kitchen. Still, she didn’t talk to me for the rest of the night. 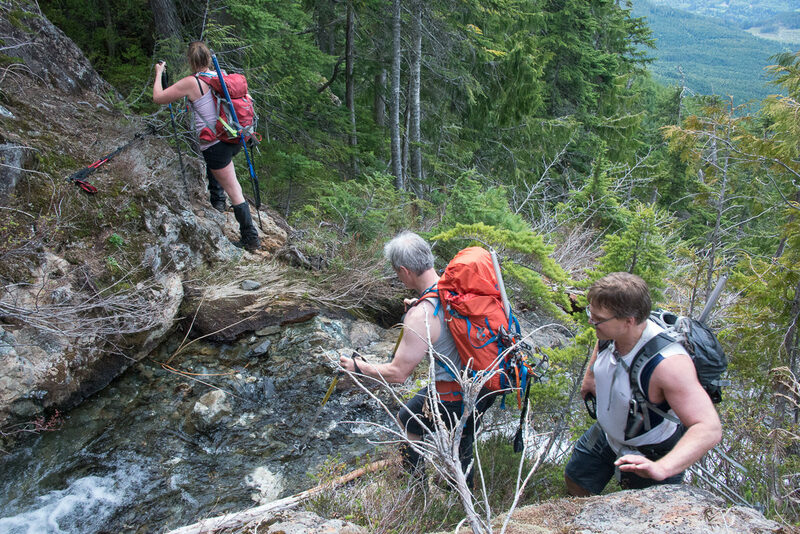 High Rigger Mountain offers spectacular views of Johnstone Strait, and the other peaks in the Prince of Wales Range. There is no route to speak of: if you try this peak, pick a line that you think will go, and trust yourself. The upper ridge to the summit is delightful. However, if you just want the views, then I highly recommend one of the other peaks: H’Kusam, Springer, Stowe, or Kitchener. 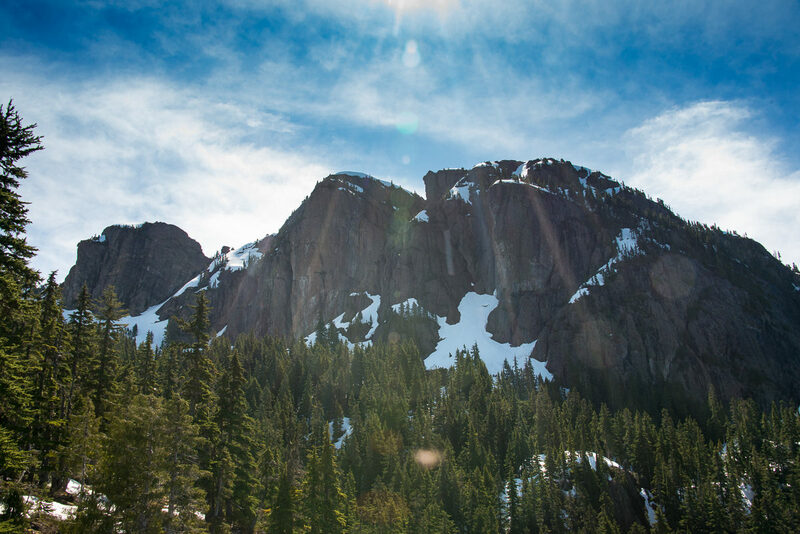 Any of these other mountains are much easier to access, and some of them even have trails. 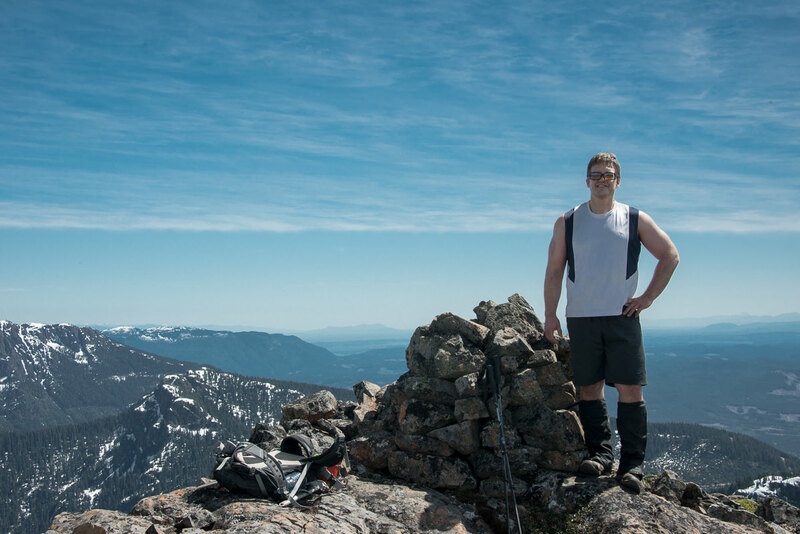 Whatever you do, make sure to hit up the Prince of Wales Range of mountains! I want to hear about your bushiest experiences! See more photographs from this trip! Matthew is an adventure blogger and photographer. He documents his adventures on explorington.com. His stories create a vivid backdrop that give his photographs cotext. He finds his adventures with the Island Mountain Ramblers, and whenever possible, his family joins his adventures. Great write up!!! It was a great day despite the bush. 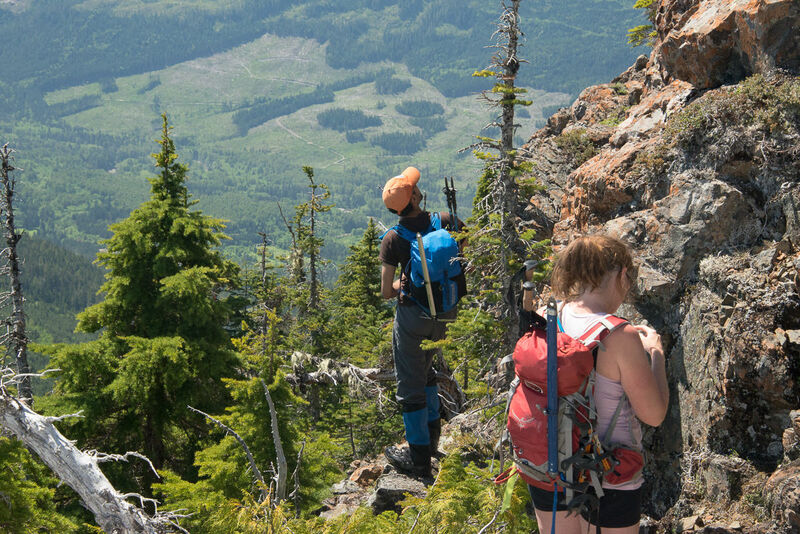 We managed to progress 200m in one hour of relatively flat slide alder. That’s my bushiest. That’s bushy?! Which hike was that Dan?